The first edition of the pamphlet on the "Left Wing of the Turkish Communist Party" was published in 2008 by the Turkish group Enternasyonalist Komünist Sol (Internationalist Communist Left, EKS), which had already adopted the ICC's basic positions as a statement of principle, and had begun to discuss the ICC's Platform. In 2009, EKS joined the ICC to form our organisation's section in Turkey, publishing Dünya Devrimi ("World Revolution"). This edition was put out in a printed format, and has never been made available online in English. We initially planned to publish a somewhat extended version of the new Turkish edition, which clarified some aspects of the original pamphlet with further references to original Turkish material. It also added as an appendix (for the first time in both modern Turkish and English), the 1920 founding declaration of the TKP in Ankara. However as work progressed on this new material it became clear that what was originally planned as a brief summary of the socialist movement in the Ottoman Empire was expanding to the point where it was already several chapters long. Work continues on the new chapters dealing with the history of the communist movement in Turkey; in the meantime we have decided to publish directly the already completed work on the Ottoman Empire. 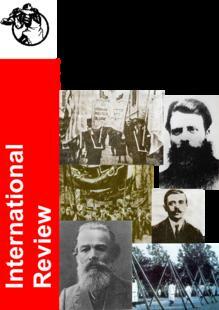 The PDF version also includes the Introduction to the 2nd English edition of the “Left Wing of the Communist Party of Turkey” which was first published in 2010, International Reviewn°142.